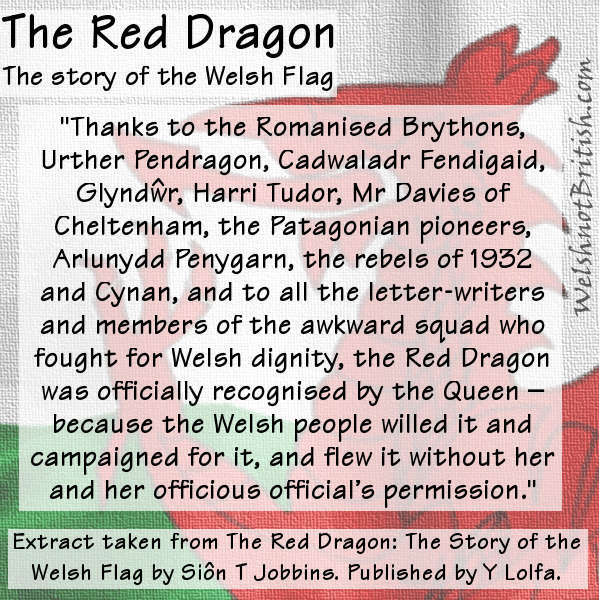 The book starts with an introduction, detailing why the author believes the Welsh flag is something to be proud of and, importantly, a very inclusive flag. He details other flags that some may find offensive. One of which is the 'Butcher's Apron' (my term) which the anti-Welsh language Wales Online recently jumped on when covering this book. They say every day is a school day and two pages in and I've already learnt something new, although I did have to look it up to find out what the 'rule of tincture' was . Our flag breaks the first rule of heraldic design, which surprisingly isn't that you do not talk about heraldic design! Colour on colour is a vexillogical no-no apparently. But when one of those colours is a big red dragon I think some artistic license should be allowed. The first extract I've chosen is from page one and sums up Y Ddraig Goch perfectly. It's awesome so we don't have to be. 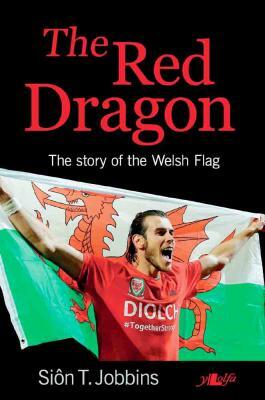 "The Red Dragon emanates a kind of Welsh genius which occasionally, very occasionally, peeks out as a rare ray of warm sunshine behind the grey cloud of Welsh mediocrity and shrugging acceptance." After the introduction the book delves briefly into the history of Wales and the island. Detailing the Roman origin of the dragon symbol and why they used it. There is a fair bit of information here and it flows nicely between fact and fiction without leaving you confused as to what is historical fact and what is mythology. "Although the white dragon is initially stronger, it is ultimately the Red Dragon which overcomes and drives the white dragon away. 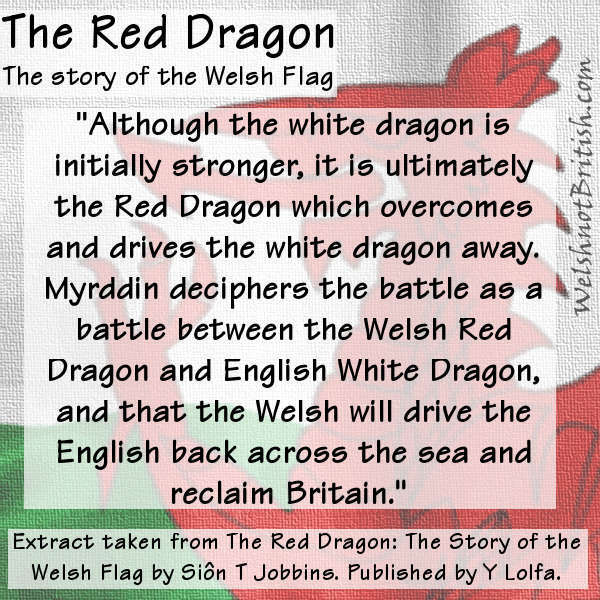 Myrddin deciphers the battle as a battle between the Welsh Red Dragon and English White Dragon, and that the Welsh will drive the English back across the sea and reclaim Britain." The next chapter deals with the history of the Age of Princes and Age of Gentry. Covering Wales, Covering Wales, the border and the use of the dragon on both its sides until the English brought St George back from The Crusades. Also getting a mention is the golden dragon of Glyndŵr. The book then details the Tudors and the inclusion of the green and white. This also leads us neatly into the white and green of the leek and how these colours have been important to Wales for as long, if not longer, than the dragon itself. The next extract is taken from the first paragraph of the chapter entitled The Sleeping Dragon and if you thought the first extract was brutal then you haven't seen anything yet! 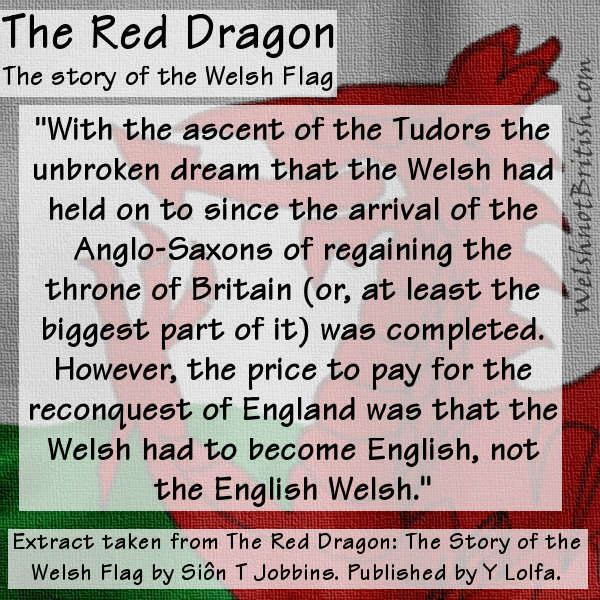 "With the ascent of the Tudors the unbroken dream that the Welsh had held on to since the arrival of the Anglo-Saxons of regaining the throne of Britain (or, at least the biggest part of it was completed. However, the price to pay for the reconquest of England was that the Welsh had to become English, not the English Welsh." The next chapter mentions how the dragon wasn't featured much over the next few centuries but it does mention other symbols, most native but some others like the feathers that were foisted upon us. The next chapter compares 18th and 19th century Wales with the African colonies who had their languages and culture but no civic nationality. This links well the next part about the Patagonian settlers who used what is now the Welsh flag on their ship when setting sail. Those remaining in Wales were content to be politically English, those leaving Wales wanted to be politically Welsh. The next extract comes from the next chapter which details how a man with the bardic name of Arlunydd Penygarn led the fight to have the dragon recognised and added to the royal arms alongside the arms of England, Scotland and Ireland. 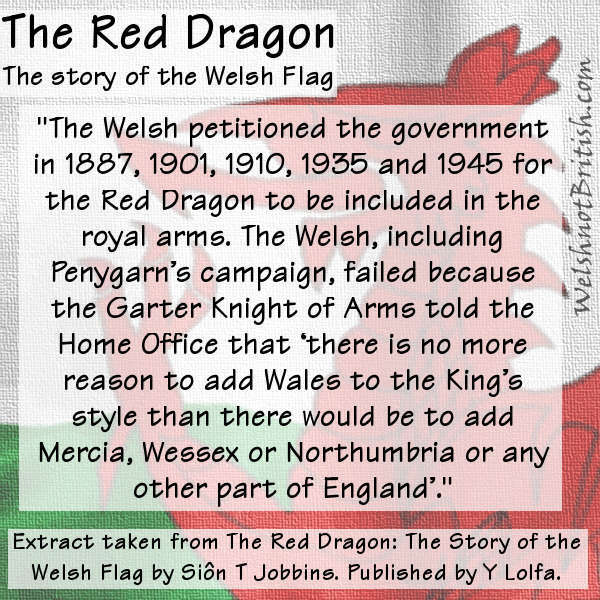 "The Welsh petitioned the government in 1887, 1901, 1910, 1935 and 1945 for the Red Dragon to be included in the royal arms. The Welsh, including Penygarn’s campaign, failed because the Garter Knight of Arms told the Home Office that ‘there is no more reason to add Wales to the King’s style than there would be to add Mercia, Wessex or Northumbria or any other part of England’." The book continues by giving examples of how the profile of the dragon started to be raised until it went from being an almost forgotten relic of a bygone era to the de-facto symbol of Wales. It also details the origins of the daffodil, something I had never really thought of and just assumed it was used because the Welsh words for daffodil (cenhinen Bedr) and leek (cenhinen) are so similar. There's lots of interesting little titbits about the rise of the flag and even some opposition towards it which is expanded on with a whole chapter detailing a battle to have the flag flown on the Eagle Tower in Caernarfon Castle. As is customary in Wales civil disobedience was followed by no one being arrested (presumably because it would publicise the event) and an eventual change of tune by those in power. Perhaps Plaid Cymru might wish to tell people of their role in raising the profile of the flag. The book details the ghastly official flag used between 1953-58 and how the Gorsedd led the campaign against it and for the flag we use today. The final paragraph of the book sums up the history of the flag and the recent fight for it. The only thing I think that is missing from this period, and it does link to the cover, was what flag was used during Wales' 1958 World Cup campaign in Sweden. "Thanks to the Romanised Brythons, Urther Pendragon, Cadwaladr Fendigaid, Glyndwr, Harri Tudor, Mr Davies of Cheltenham, the Patagonian pioneers, Arlunydd Penygarn, the rebels of 1932 and Cynan, and to all the letter-writers and members of the awkward squad who fought for Welsh dignity, the Red Dragon was officially recognised by the Queen – because the Welsh people willed it and campaigned for it, and flew it without her and her officious official’s permission." The last couple of chapters cover the last few decades, the rise of nationalism in the sixties to the advent of devolution. It features some stories that hit the news a little about the standardisation of the flag and also explains the rules of tincture. There's a brief section about other flags of Wales, Wales has a lot of flags and to cover them all in any real detail could fill a whole book (hint hint). I enjoyed the book and learnt quite a few interested things, not just about the flag itself but about the battles for the flag. Some of the extracts I have selected above were chosen because of how brutally eloquent they were. I'm not a prolific reader by any stretch of the imagination but I did enjoy reading this book and posting extracts from it. At less than £4 you would pay more for a coffee or a pint in some places. I'll definitely be looking out for some of Siôn's other books. I'll be closing the competition at midnight on the 22nd March. I'll start to collect entries from the facebook posts and twitter as well as comments on here, depending on whether you are viewing on web or mobile you will see different comments. I keep meaning to fix that! Also, the author has kindly offered to donate the prize himself which means he'll even sign it for you. Once I've picked a winner I will notify them and the author so he can do the honours. 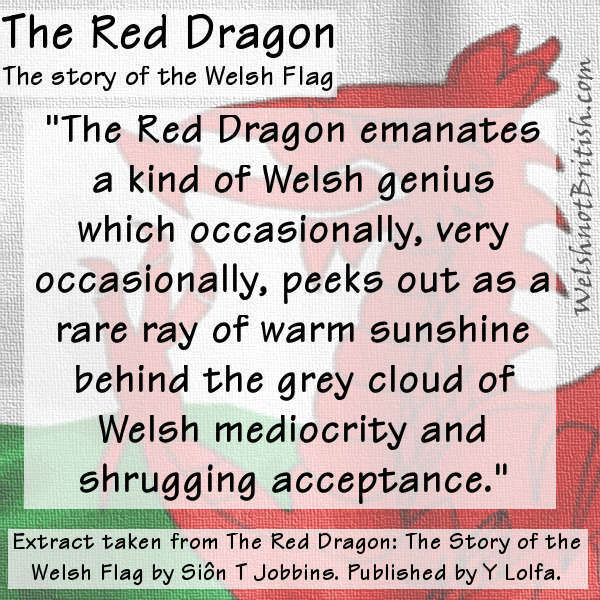 Over the next week or so I'm going to be reviewing and posting extracts from Siôn T Jobbins' new book, The Red Dragon - The story of the Welsh Flag. I'll also be giving a copy away. In order to enter simply leave a comment here (use an email I can contact you with), retweet one of the extract tweets or tag yourself on the facebook posts. I'll also include facebook shares but since it doesn't always show me who has shared (depending on privacy settings) I can't guarantee you'll be included. Tagging does a similar job but it means I can see everyone. 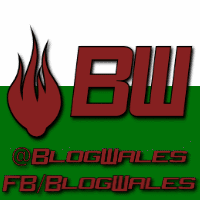 You can also follow Siôn via this handy button. Love the line about "shrugging acceptance". Frustrstingly, sums us up perfectly.